Valentine's Day at the sweetest little restaurant in Monterey! 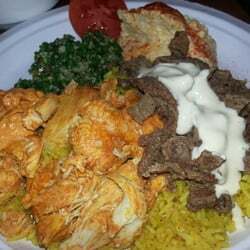 Some of the best middle eastern food I've ever had. #montereybay. Kefta Kabob served on paper plates. Was so delicious. If you're ever visiting the Monterey Bay Aquarium I would stop here for a meal. This picture does no justice to the amazing Mediterranean meal we just had made by the one-man show @ #paprikacafe. Turkish Coffee. Watch out men drinking at Carbone's.. I'm headed there next!